Notes: This is a co-release with Sawtooth Records. 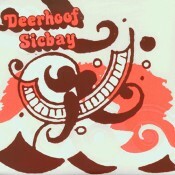 Sawtooth is Nick from Sicbay’s label. The first 599 covers were hand screened and designed by Amy Jo Hendrickson in Minneapolis. Artwork was featured in a book on DIY 7″ artwork called Touchable Sound These songs appear only on this release. Vinyl has long been out of print.